Placing the quality rating into context is what really matters and what was intended by Benjamin Graham and leader of the modern investment club movement, George Nicholson. Superior comparative record over time. Our quality ratings (scores) can be regarded as scored industry studies. But placing the quality rating into context is what really matters and what was intended by Benjamin Graham and leader of the modern investment club movement, George Nicholson. Effective immediately, the QUALITY characteristic on dashboards and company reports will convert to a PERCENTILE RANKING. Going forward, an excellent quality ranking ranges from 80-100, top quintile. The change for most companies will be relatively small, less noticeable. But we’ll no longer need a decoder ring to identify quintile rankings. We believe that (1) you’ll get used to this very quickly and (2) probably wonder what took us so long. Quality Matters. 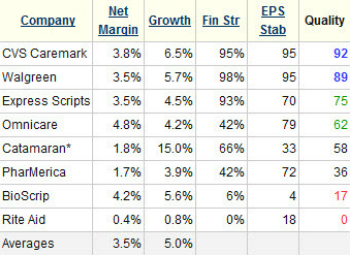 Leadership companies with solid expected returns. Our community has always sought effective investment opportunities: excellent companies at sufficiently-high return forecasts. Benjamin Graham believed that there was a direct connection between the quality of a company and its P/E ratio. The most important lesson that I’ve learned in over ten years of carefully studying (and practicing) long-term fundamental investing is that QUALITY MATTERS. What is Quality? What is the role of quality in strategic long-term investing? Can we measure quality? And if so — we can rank it for comparison purposes, the intent of Graham (and Nicholson’s) suggestion. This article first appeared in the early days of Manifest Investing … and we’re updating and editing it to reflect this change — and to underscore that absolutely nothing about the philosophy/approach actually changes. It merely gets easier to identify excellent, good and poor companies. Quality is measurable and it can play a significant role in helping investors to avoid trouble. The time-honored path to success with strategic long-term investing is paved by understanding and respecting quality. Quality. We all believe we know it when we see it. What’s it worth? 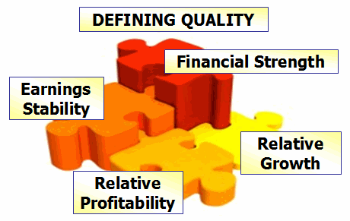 www.investorwords.com has a powerful definition for “quality.” Quality is, quite simply, a measure of excellence. Excellence and respect are related. Excellent companies often exhibit consistent, credible growth and better results. It must be important. Benjamin Graham was deeply troubled back in 1934. The antics and disasters of the late 1920s revolved around a lack of appreciation and respect for the fundamental quality characteristics of companies. Monitoring the quality and projected return characteristics of all of the holdings in your portfolio is a valid approach to portfolio management. 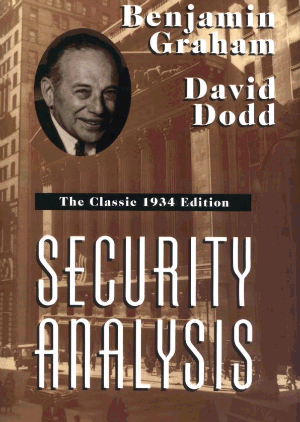 Graham reviewed “research” practices in place at the time and in 1934 wrote the first edition of Security Analysis. Authors Benjamin Graham and David Dodd dedicate a fair amount of attention to the subject and influence of quality on investments. Quality was a cornerstone of Nicholson’s contribution to the 1984 NAIC Investors Manual. Scoring and Rating Quality. We examine the growth and profitability forecast for any company vs. peers or competitors. This is combined with an assessment of consistency (EPS stability) and financial strength (strong balance sheet, etc.) and all four factors combine to form the quality rating for any company. Grading on a Curve: Ranking Quality. The quality rating is continuously ranked. In this case, the 77.4 quality rating for CVS becomes a quality ranking of 92 as displayed on the company report, industry summary and dashboards that include CVS. CVS quality ranks in the top 8% of all companies. Nicholson’s components of quality were virtually identical. During our stock studies, we build expectations in the form of sales growth and profitability forecasts. The intangible factors are covered when we perform an industry study. Why? Because industry studies generate some guidance with respect to relative sales growth and profitability by making comparisons. Quality is important. Ben Graham spent a lifetime of investment analysis seeking a reliable means of gauging it. If relative quality is important, and has a role in the realm of portfolio design and management, then we ought to seek means of measuring it. Industry Snapshot: Pharmacy Services. This profile of the pharmacy services industry has been sorted from highest to lowest quality ranking. The excellent companies are CVS Caremark and Walgreen while Rite Aid has considerable room for improvement. Growth and profitability forecasts are scored against the industry averages shown here. The accompanying table presents a profile of the Pharmacy Services industry. The sales growth and profitability (net margin) forecasts are compared vs. the industry average and combined with the financial strength and earning stability rankings as we build the quality rating. The quality rating for any company ranges from 0-to-100. Based on the works of Graham, the 100-point scale includes four factors: Relative Sales Growth Forecast, Relative Profitability Forecast, Financial Strength and Earnings Stability. The larger companies in the group are CVS Caremark and Walgreen. The average sales growth forecast for the Pharmacy Services industry is 5.0%. Note that the highest growth rates are 15% for Catamaran and 6.5% for CVS. We display the quality calculation break outs for any company on the equity analysis summary. In this case, the 6.5% growth rate for CVS is compared vs. an industry average of 5.0%. The average profitability for the group is 3.5% and CVS ranks among the leaders at 3.8% but fairly near the industry average. Therefore, the components for relative sales growth and profitability come in fairly closely to an average rating (12.5 pts) at 16.2 and 13.7 respectively. What goes into the Financial Strength rating for each individual company? At Manifest Investing, we build a composite grade based on Morningstar, Standard & Poor’s, Value Line and factors like effective interest rate (which should align with investment grade) when compiling an aggregate rating. We then percentile rank all 2400+ companies to determine the overall financial strength rating. For more on this, see the cover story in the January 2007 newsletter (Summing Our Financial Strength). This factor is actually a numerical score that reflects the straightness of the EPS historical trend and analyst consensus estimates (when available) for the next couple of years. EPS Stability is based on year-to-year comparisons. The most reliable forecasts tend to be those with the highest rating (100); and the least reliable, the lowest (0). The earnings stability is statistically derived from the amount of fluctuations, or variations from a straight line. A straight line would generate an EPS Stability of 100. For CVS, the EPS Stability is 95 (nearly a straight line and relatively impressive for a retailer) and the QR calculation becomes (0.95)(25) = 23.7. For more on EPS Stability, see the cover story in the June 2006 newsletter (Unlocking the EPS Stability Code). The color coding is unchanged. Companies with excellent quality rankings are highlighted with blue text and good companies, green. Poor companies are still coded in red. Our studies of successful long-term investors and their portfolios has suggested that the overall quality rating for their holdings tends to “hover” near or above the 80th percentile.Balance is always important in portfolio design and management. Successful investors balance their deep blue chips with promising smaller companies in a continuous process. Do your best to grasp and understand the underlying principles. Attention is quickly drawn to the considerations of relative sales growth, profitability comparisons, financial strength and stability of earnings. In summary, quality matters and the quality ranking essentially becomes a “scored industry study” that is influenced by changes in internal fundamentals as well as shifts in all covered companies. Any deterioration in quality should be taken seriously and prompt further study. Boost quality while bull markets rage and relax (to capture opportunity) when bear markets deliver the higher-growth candidates. Screen for excellent companies (Quality > 80) during your regular quests. Our holdings should exhibit a sufficiently high level of overall quality — a line of thought that I’m sure Benjamin Graham, George Nicholson and you should be most comfortable with.